Two widespread species of forktails in Arizona are the Desert Forktail and the Rambur’s Forktail. Both species are often encountered at a same location. To separate males of the two species, focus on the thoracic stripes and the shape of the abdominal black stripes. In the hand, the shape of male appendages is characteristic of each species. See photos at the end of each species’ photo page. 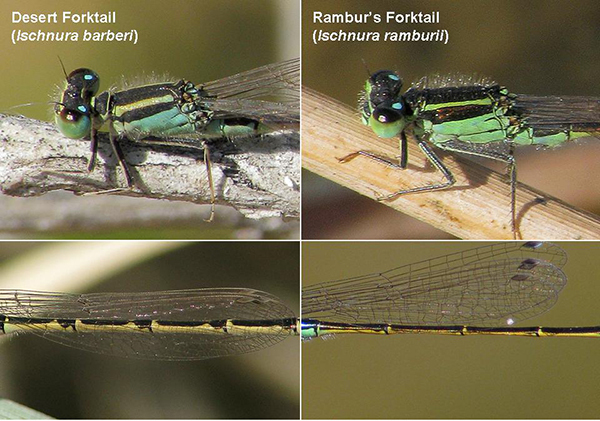 As in other forktail species, females come in two forms: Heteromorph and andromorph (= male-like). The color pattern of mature of andromorph females is very similar to that of conspecific mature males. Lateral views of the head/thorax and middle abdominal segments of the Desert and Rambur's Forktails, AZ. Rambur’s Forktail: paraprocts short and straight. Lateral views of the appendages of the male Desert and Rambur's Forktails, AZ.